On my last trip to the P-town I stopped in the Petaluma Market (highly recommended, and also the source of the umlaut disaster) where I noticed a spate of new offerings from a city dominated by one of the largest and most delicious craft breweries in the country (Lagunitas). Sonoma County might seem like a tough place to fire up a new brewery (especially with heavyweights like Russian River not far away), but this is where, as I've seen it put, "country meets city"--you can see a deer on your way to a hot rod show. So, I'm betting there's a lot of pride in locally produced goods, meaning a new craft brewery making good beer can probably do quite well. So enter 101 North Brewing Co. I know exactly jackshit about them, and have never seen them around (again, like the umlaut disaster). The bottle is pretty cool though: it makes me think of basically any comic book movie, but mainly Ghostbusters II and Vigo the Carpathian (the best part of the movie, though, is Janosz). The beer is good, but not mind blowing. 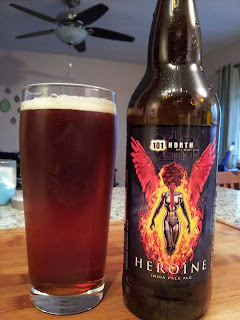 The base is more akin to a red ale, and it's decently hoppy; but, something about it is just not quite right. Something's missing and I'm not qualified to say what. The nose is a bit too boozy, maybe. Or the hopping is too simple. I could use another opinion here, guys! On a positive note, I can definitely taste the potential in both the beer and the brewery And that's a good thing because competition is always important in the beer world. So, 101, keep on keepin' on and I'll keep trying your stuff.